In Outward you need to take care of your character's health to stop them from getting negative statistics which will make them become weaker and slower. This means it is important that you continuously keep an eye on your character's hydration and food to prevent them from getting thirsty or hungry. Food must also be carefully harvested to stop them from getting ill from food poisoning. Check out our food crafting guide to learn how to make different dishes without recipes. 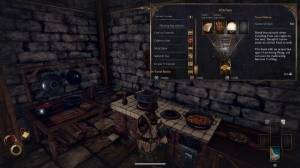 It is not necessary to have in-game recipes to craft food in Outward, you will be able to craft food just by having the required ingredients and by using the manual recipe function. It is recommended that you craft your meals whenever possible as doing so will allow you to save money and time as you won't have to purchase or find recipes. If you do acquire any recipes you can use them from your inventory to add them to your recipe list instantly. The following recipes are made in a kitchen or by using a cooking pot over a fire. You can just use a fire for boiled versions of single ingredients. 2x Raw Alpha Meat, 2x Salt. 1x Smokeroot, 1x Raw Alpha Meat, 1x Woolshroom, 1x Bread. 3x Marshmelon, 1x Gaberry Jam. 1x Bread, 1x Garberry Jam. 1x Meat, 1x Vegetable, 1x Salt. 2x Food (any), 1x Salt. 1x Raw Rainbow Trout, 1x Seaweed, 1x Salt. 2x Egg, 1x Common Mushroom. 1x Larva Egg, 1x Fish, 1x Seaweed. 1x Azure Shrimp, 1x Raw Rainbow Trout, 1x Larva Egg 1x Seaweed. 3x Predator Bones, 1x Clean Water. 2x Cactus Fruit, 2x Egg. 1x Raw Alpha Meat, 1x Bread. 2x Cactus Fruit, 1x Bread. 1x Miasmapod, 1x Meat, 1x Marshmelon, 1x Salt. 1x Raw Alpha Meat, 1x Marshmelon, 1x Gravel Beetle. 1x Marshmelon Jelly, 1x Bread. 1x Raw Jewel Meat, 1x Meat, 1x Cactus Fruit, 1x Salt. 1x Clean Water, 1x Seaweed. 1x Clean Water, 1x Ochre Spice Beetle. 1x Clean Water, 1x Gravel Beetle. 1x Clean Water, 1x Cactus Fruit. Some of the food and beverages in our food crafting guide are better than others due to the added effects they give your character, below is a list of those we recommend you should craft if you have the ingredients. Ingredients: 1x Smokeroot, 1x Raw Alpha Meat, 1x Woolshroom, 1x Bread. Effect: Restores 225 Food. Heals wounds over time, grants warm boon and an increase in stealth. Effect: Restores 275 food. Confers an immense stamina recovery. Ingredients: 1x Miasmapod, 1x Meat, 1x Marshmelon, 1x Salt. Effects: Restores 200 food. Immediately heals wounds, unlike most food. Gives the Possessed boon. Ingredients: 1x Raw Alpha Meat, 1x Marshmelon, 1x Gravel Beetle. Effect: Restores 300 food. Gives Impact Resistance as well as adding Impact to one's attacks with the Rage status. Effect: Restores 70 Drink; instantly cures infections, protects against cold, and restores burnt Stamina.